Every morning should begin with sparkling wine. The small bubbles, the faint scent of red apples, and the tartness of the Brut Nature in the long-stemmed glass in front of you awakens your senses for the day. You would have been fine with the cup of strong espresso, the still-warm croissants, and the plate of farm-fresh eggs on the table. 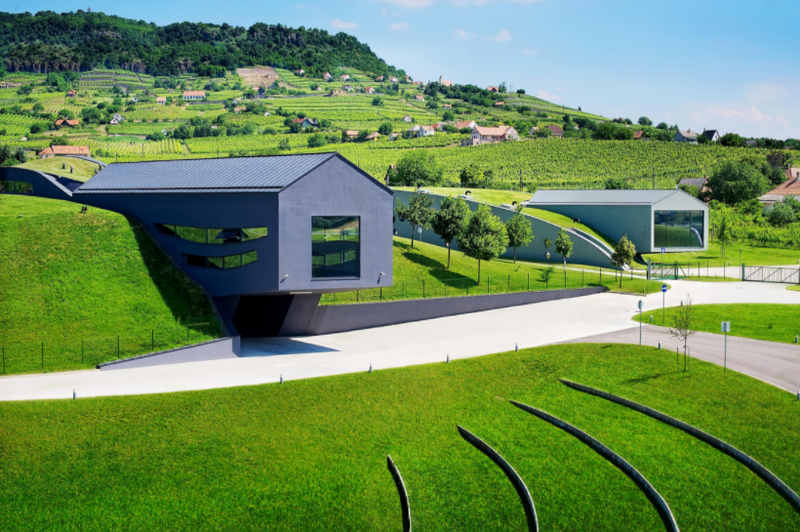 The modern space, the floor-to-ceiling glass windows, and the view of the striking winery, with the budding vines in the background, don’t hurt either. But it’s the wine that really makes you excited for the day ahead. This perfect wake-up call is courtesy of Kreinbacher Birtok, a winery and a hotel in Somló. Somló is Hungary’s smallest wine region. It sits in the northwest part of the country, west of Budapest and not far from the Austrian border, on the slopes of an extinct volcano. The wine grown here was once favored by the kings and the priests who ruled the area; the ruins of an 11th-century castle still stand on the hillside today. While the mostly white wine grapes, which thrive in the volcanic soil, have an acidic-mineral taste. Kreinbacher Birtok is a relatively new winery. Though grapes have been grown on this land for centuries, the estate was only founded in 2002. But it quickly flourished. New, modern buildings were built into the surrounding landscape in 2011. They have an industrial vibe with lots of concrete. Traditional grapes—Jukfark and Furmint and Welshriesling—grow in the background. Plus their first sparkling wines were released in 2014. Then there’s the boutique hotel. The urban look on the outside turns into a Scandinavian feel—with wood, glass, and minimal decor—inside. 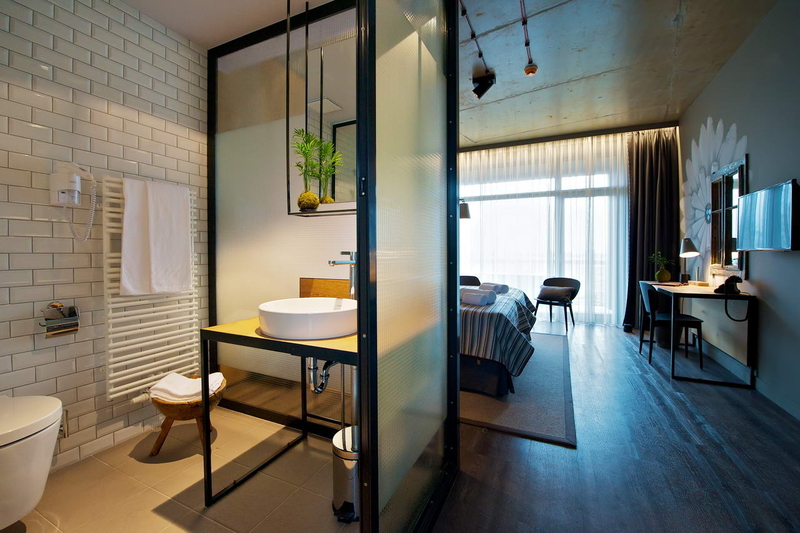 There are frosted-glass bathrooms with heated towel racks. Track lighting and strategically placed lamps warm the rest of the rooms. Small terraces offer views of the vines. You find a similar view in the Winebar, where an armchair is the perfect place to relax with a glass of wine. While the sleek bistro offers five-course dinners featuring local ingredients and modern takes on traditional Hungarian dishes. But you’re nowhere near ready for dinner. First, you plan on hiking Somló Hill to see the Kőkonyha viewpoint, the Barát cliff, and St. Elaine Chapel. You want to visit nearby Sümeg Castle, the largest medieval castle in Hungary. You hope to explore the three-kilometer-long Tapolca Lake Cave, which is said to help alleviate allergies and asthma. You’ll see what you have time for, though. You don’t want to miss your scheduled cellar tour and wine tasting later this afternoon back at Kreinbacher Birtok. You want to taste the Hárslevelű, a wine made from indigenous Somló grapes, and the Syrah, a rare red for the area. But you’re even more excited about the rest of the sparkling wines. They’re made in a French méthode traditionnelle style and are aged for 24-36 months. In addition to the Brut Nature, they offer an Extra Dry, a Brut Classic, and a Brut Prestige. A sparkling-wine tasting sounds like the perfect way to spend the afternoon after your morning started with bubbles. Egészségedre!